There are two types of atomic explosions that can be facilitated by Uranium-235: fission and fusion. Fission, simply put, is a nuclear reaction in which an atomic nucleus splits into fragments (usually two fragments of comparable mass) all the while emitting 100 million to several hundred million volts of energy. This energy is expelled explosively and violently in the atomic bomb. A fusion reaction, on the other hand, is usually started with a fission reaction. 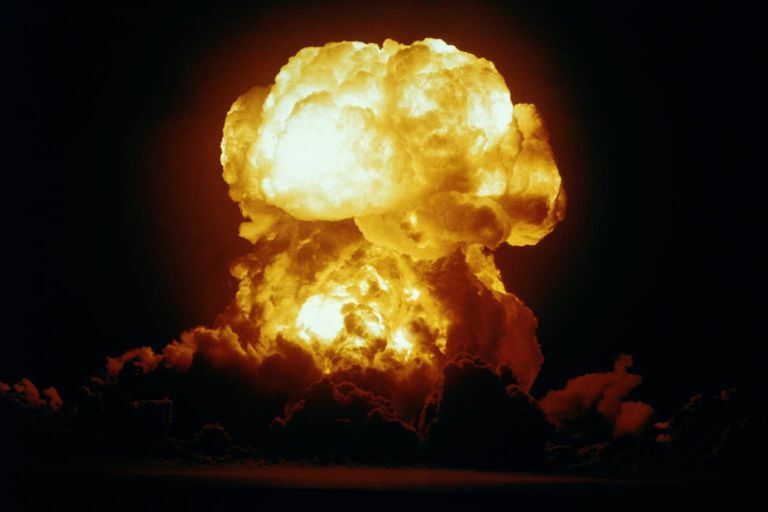 But unlike the fission (atomic) bomb, the fusion (hydrogen) bomb derives its power from the fusing of nuclei of various hydrogen isotopes into helium nuclei. This article discusses the A-bomb or atomic bomb. The massive power behind the reaction in an atomic bomb arises from the forces that hold the atom together. These forces are akin to, but not quite the same as, magnetism. Atoms are comprised of various numbers and combinations of the three sub-atomic particles: protons, neutrons, and electrons. Protons and neutrons cluster together to form the nucleus (central mass) of the atom while the electrons orbit the nucleus, much like planets around a sun. It is the balance and arrangement of these particles that determine the stability of the atom. Most elements have very stable atoms which are impossible to split except by bombardment in particle accelerators. For all practical purposes, the only natural element whose atoms can be split easily is uranium, a heavy metal with the largest atom of all natural elements and an unusually high neutron-to-proton ratio. This higher ratio does not enhance its "splitability," but it does have an important bearing on its ability to facilitate an explosion, making uranium-235 an exceptional candidate for nuclear fission. There are two naturally-occurring isotopes of uranium. Natural uranium consists mostly of isotope U-238, with 92 protons and 146 neutrons (92+146=238) contained in each atom. Mixed with this is a 0.6% accumulation of U-235, with only 143 neutrons per atom. The atoms of this lighter isotope can be split, thus it is "fissionable" and useful in making atomic bombs. Neutron-heavy U-238 has a role to play in the atomic bomb as well since its neutron-heavy atoms can deflect stray neutrons, preventing an accidental chain reaction in a uranium bomb and keeping neutrons contained in a plutonium bomb. U-238 can also be "saturated" to produce plutonium (Pu-239), a man-made radioactive element also used in atomic bombs. Both isotopes of uranium are naturally radioactive; their bulky atoms disintegrating over time. Given enough time (hundreds of thousands of years), uranium will eventually lose so many particles that it will turn into lead. This process of decay can be greatly accelerated in what is known as a chain reaction. Instead of disintegrating naturally and slowly, the atoms are forcibly split by bombardment with neutrons. A blow from a single neutron is enough to split the less-stable U-235 atom, creating atoms of smaller elements (often barium and krypton) and releasing heat and gamma radiation (the most powerful and lethal form of radioactivity). This chain reaction occurs when "spare" neutrons from this atom fly out with sufficient force to split other U-235 atoms that they come in contact with. In theory, it is necessary to split only one U-235 atom, which will release neutrons that will split other atoms, which will release neutrons ... and so on. This progression is not arithmetic; it is geometric and takes place within a millionth of a second. The minimum amount to start a chain reaction as described above is known as supercritical mass. For pure U-235, it is 110 pounds (50 kilograms). No uranium is ever quite pure, however, so in reality more will be needed, such as U-235, U-238, and Plutonium. Uranium is not the only material used for making atomic bombs. Another material is the Pu-239 isotope of the man-made element plutonium. Plutonium is only found naturally in minute traces, so useable amounts must be produced from uranium. In a nuclear reactor, uranium's heavier U-238 isotope can be forced to acquire extra particles, eventually becoming plutonium. Plutonium will not start a fast chain reaction by itself, but this problem is overcome by having a neutron source or highly radioactive material that gives off neutrons faster than the plutonium itself. In certain types of bombs, a mixture of the elements Beryllium and Polonium is used to bring about this reaction. Only a small piece is needed (supercritical mass is about 32 pounds, though as little as 22 can be used). The material is not fissionable in and of itself but merely acts as a catalyst to the greater reaction.